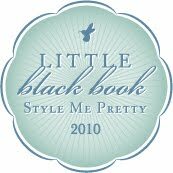 We're super excited to annouce that we are now part of the Little Black Book on Style Me Pretty. After telling Ken one night how awesome this website is, I got an exclusive invitation to join their site the very next morning! If you have never visited the Style Me Pretty (SMP) blog, you simply MUST! The ideas that Abby and her team come up with and the inspiration that flows through from that entire website is always stunning! You can check out our link here...Ken will be updating our portfolio on their site with our newest and most unique wedding cakes!